Anyone who’s read Hilary Mantel’s Wolf Hall will be aware of the staggering duplicity, hypocrisy and Machiavellian dishonesty that seemed to be a prerequisite of life at the Tudor court. But what of the ordinary people, those who were living through the population explosion between 1520 and 1600? Ninety percent of people lived in rural areas and left home because of unemployment, and thanks to Henry VIII's dismantling of the Church's infrastructure, the poor were no longer able to rely on religious charity and welfare. So where did they turn? For some, to crime. To mark the 2017 BBC Reith Lectures with Hilary Mantel, we invite you to take a glimpse at the Tudor underworld. A Tudor executioner brandishes an axe ready to punish the most serious offenders. The cities were dangerous places for country dwellers, and for those who’d learned to navigate them, country visitors were easy meat. An exercise in robbing a farmer would be called “cony catching”, “cony” meaning “rabbit”. With food prices and unemployment rising the only choice for the jobless able-bodied was the workhouse, and conditions of workhouses varied from parish to parish. No wonder so many took their chances in the underworld. And who’d be doing the cony catching? A nip, or a foist. Both of these were petty thieves, also called cutpurses because of their modus operandi, which was generally to slice through the cord securing a money bag to a belt. The cutpurse would be off in the crowd and the poor cony would be left to make his way home, penniless, as best he could. A more superior form of robber was the ruffler. He would often dress as a soldier to inspire trust and then mug his victim. Rufflers were ex-soldiers who refused to beg. Beggars were loathed, and as begging was illegal, if they were caught they could be flogged until their backs were “bloody”. Certain types of requests for charity, or alms, were permitted when accompanied by a licence. And where would you get your fraudulence licence? From a jarkman. A jarkman was much sought after. Jarkmen supplied fraters with false licences claiming that the licence owner ran an almshouse and was collecting on behalf of the poor. In fact the frater was pocketing the earnings. Collecting alms or begging for charity was a profitable area because, for the Tudors, donating to the poor and needy was a way of paying penance for sins. Another technique was that employed by the palliard or clapperdudgeon. A married couple, or at least a couple that worked together, would split up and beg separately for alms at houses, knowing they would be given more if they begged as individuals. The couple then joined forces and sold their spoils. 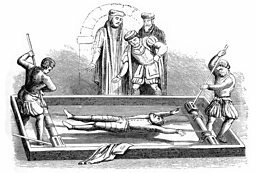 The rack was used as a torture method for serious crimes throughout the Tudor period. A prigger of prancers worked alone. He was a horse thief, who would offer to guard a nobleman’s horse while he attended to business: as soon as the hapless owner was out of sight the prigger would gallop off and sell the prancer in a neighbouring town. Early Tudor laws aimed at punishing the poor to deter idleness. The Vagabonds and Beggars Act of 1494 approved by Henry VII declared that “idle persons” should be placed in the stocks and then returned to the Hundred where they last dwelled or were born. “Counterfeit Cranks” would use crutches, feign blindness or pretend to be mute in order to win sympathy and alms. For example in 1566, one such Counterfeit Crank, Nicholas Jennings, was caught with a bag of blood which he used to paint fake injuries on his head to beg an average of 13s 2d a day – the equivalent to a workman’s wages for a fortnight. And finally, we have the whipjack, or the sarcastically named “fresh-water mariner”. This gentleman would pretend to be a sailor whose ship had gone down after being attacked by pirates off the coast of Devon or Cornwall. He would head inland with fake certificates purporting to be from the Admiralty, saying he was to be given funds urgently to return to his home county. Bawdy Basket – a young woman who carries a basket of cheap jewellery and cloth to sell to the servants of a big house. Once she’s in, she steals. What are the Reith Lectures? The Reith Lectures were inaugurated in 1948 by the BBC to mark the historic contribution made to public service broadcasting by Sir John (later Lord) Reith, the corporation's first Director General. Reith maintained that broadcasting should be a public service which enriches the intellectual and cultural life of the nation. It is in this spirit that the BBC each year invites a leading figure to deliver a series of lectures on radio. The aim is to advance public understanding and debate about significant issues of contemporary interest. The 2017 BBC Reith Lecturer will be the award-winning writer Hilary Mantel. Her five lectures entitled Resurrection: The Art and Craft, will focus on history’s hold on the imagination. CRAFT: CAN THESE BONES LIVE? Philosopher and cultural theorist Kwame Anthony Appiah delivers the 2016 lecture series. Professor Stephen Hawking delivers two lectures on the nature of black holes. Surgeon and writer Dr Atul Gawande delivers the 2014 lecture series. Grayson Perry discusses what makes him an artist and the limits of contemporary art. Novelist Dame Hilary Mantel discusses the role that history plays in our culture. Significant international thinkers deliver the BBC's flagship lecture series. Discover more about the history of The Reith Lectures.